One tool every EMC test lab should own is a harmonic comb generator. A comb generator is simply a device that will produce a set of harmonically related CW signals whose spacing is based on a fundamental oscillator frequency. For example, if we were to start with a 10 MHz clock oscillator and feed the digital output into a coax connector, we’d produce a series of CW higher-order harmonics spaced every 10 MHz apart. Generally, the harmonic amplitudes produced are fairly consistent, so they may be used as a frequency and amplitude calibrator. Comb generators are most often used for ensuring your semi-anechoic test chamber is reading correctly from day to day. Simply place the generator on the turntable and measure specific harmonics each day and record the trend data. I’ve occasionally found loose coax connectors or bad coax cables by comparing the current readings with past data. This would also fulfill the requirement for “equipment verification testing” as specified in ISO 17025. However, there are several other interesting uses for these generators, especially if you build yourself a small one. We all know that fast digital signals produce a range of harmonics. A periodic square wave (Figure 1) may be represented by a series of more basic signals called “basis functions” (Figure 2). Assuming the rise and fall times of the square wave are straight up and down, an infinite number of harmonically-related basis functions, or sine waves are required. 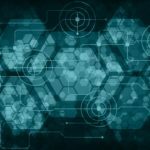 Digital circuitry today uses rise and fall times of sub-nanoseconds, which can generate harmonics ranging up to several hundreds to thousands of MHz. Figure 1 – A periodic square wave digital signal. The rise and fall times determine the amount of harmonic content in the frequency domain. If we take a simple crystal oscillator and capacitively couple the output to a coax connector, we’ve just created a pulse generator. The capacitor differentiates the square wave, allowing only the edges to pass as positive and negative-going spikes. These pulses result in a “comb” of harmonics spaced at half the fundamental frequency. The better comb generators generally use a capacitively-coupled diode following the digital clock signal. These can be a standard signal diode, a Schottkey diode, a step recovery diode (SRD) or even a high frequency (2-3 GHz) emitter-base junction. When these semiconductor junctions come out of reverse-bias, they “snap” on with a very fast edge – on the order of picoseconds for SRDs (Figure 3). Figure 3 – An idealized waveform of the forward and reverse current through a step recovery diode (SRD), or equivalent high frequency diode. 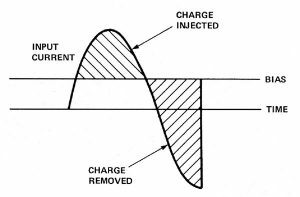 Note that the reverse current tends to “snap” off quickly, creating a very fast edge and corresponding high frequency harmonics. 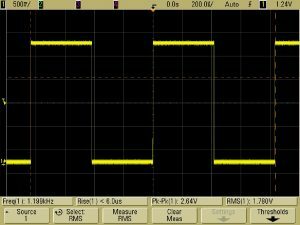 Most simple comb generators simply utilize the fast edges from a crystal oscillator or oscillator module. Long time publisher, Gary Breed, devised a simple version using only a crystal and quad NAND gate (Reference 2). This is the lowest-cost design I’ve seen. AMSAT-UK has a design that can easily go to 6 GHz (Figure 4). This may be purchased as a parts kit for about $35. The unit uses a 96 MHz crystal, whose oscillator feeds a MAR-3 microwave amplifier and then into back-to-back SRD diodes. This design produces useful harmonics to 6 GHz (Figure 5). 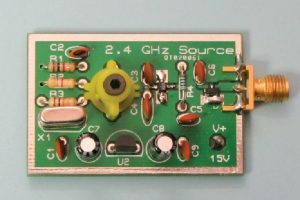 Figure 4 – The AMSAT-UK 2.4 GHz comb generator kit costs about $35 and produces useful harmonics to 6 GHz. Figure 5 – The harmonic spectrum of the AMSAT-UK comb generator. 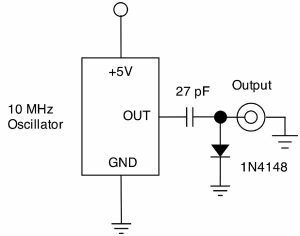 If a comb generator is needed quickly, simply start with a crystal oscillator module and couple the output through a small capacitor. The value matters very little and can range from 27 pF to 100 nF. This will generally produce nice harmonics up through 300 MHz, or more. For example, a 10 MHz oscillator will produce positive and negative spikes every 5 MHz, producing harmonics every 5 MHz. If the oscillator is near a 50% duty cycle (rare), the even-order harmonics will be suppressed to some degree. Adding a high-current driver will usually square up the edges better and create higher frequency harmonics. Adding a single diode or back-to-back diodes will also get you higher in frequency. The better comb generator designs will use Schottkey or SRD diodes. Because SRDs are mighty expensive and somewhat hard to find, you may also use the base-emitter junction on one of the high frequency (ft of 2-3 GHz) transistor. Let’s take a look at a simple circuit I use for some of my EMC seminar demos (Figure 6). This was developed by EMC consultant, David Eckhardt (Reference 4). Figure 6 – A simple comb generator using a 10 MHz oscillator, a capacitor (almost any value will work fine) and small signal diode. The harmonics start tapering off around 300 MHz. This was built on a small perf-board (Figure 7) and includes a 5V regulator, so it can be powered from a 9V battery. Figure 8 shows the waveform at the output. As you can see, the capacitor differentiates the rising and falling edges and the diode, when biased off, creates a very fast edge – on the order of 5 nanoseconds. Because the capacitor passes both the leading and falling edges, the harmonics generated will be 5 MHz apart (Figure 9). By utilizing a DIP socket, I can plug in different frequency oscillators, depending on my needs. Figure 7 – The simple DIY comb generator I use for demonstration purposes during my EMC seminars. Figure 8 – Resulting waveform for the simple DIY comb generator. The series capacitor differentiates the square wave from the oscillator and the approximately 5 nanosecond pulses create the harmonic content. Figure 9 – Representative harmonics from the DIY comb generator. The lower harmonics are the even-order ones due to the oscillator deviating from a perfect 50% duty cycle. A number of companies make harmonic comb generators. I purchased a low-cost comb generator (Figure 10) from Applied Electromagnetic Technology (AET) for approximately $350 (www.appliedemtech.com). These generators are available in various fundamental comb frequencies from 1.8 MHz up to 200 MHz and have useful harmonic frequencies well into the GHz. 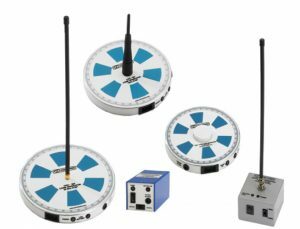 For general-purpose use, their 10 MHz model works well and produces harmonics from 10 to over 1000 MHz. A small USB power supply or USB port is used for power. 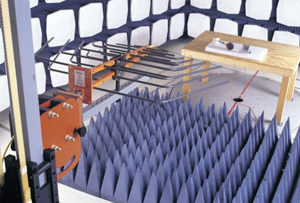 The company also makes models specifically for measurement verification of semi-anechoic chambers. 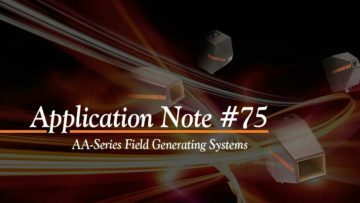 Read the full review of two of these generators in the Technical Articles section of my Web site (Reference 7). Figure 10 – Example of the AET comb generator (model USB-S-10). This $350 unit is USB-powered and produces 10 MHz harmonics out past 1 GHz. Because the rise times of the AET generator are in the 2 ns range, the pulses create a wide range of harmonics. The 10 MHz model produces useful harmonics out beyond 1000 MHz. A sample voltage output from their 1.8 MHz AET generator is shown in Figure 11. Figure 11 – The output pulses from the 1.8 MHz version of the AET generator. The rise time is about 2 ns. Using a comb generator as a standard source for verifying chambers will require an omnidirectional antenna. The antenna used (Figure 12) is available through Evans Engineering as their model EE-3 (Reference 12), but may be easily constructed from telescoping antennas or welding rod. As you can see (Figure 13), it appears to yield a good omnidirectional radiation pattern. Figure 12 – Reference antenna used for comb generator testing in a 3m chamber. The elements are telescoping, but I used it in the collapsed state to emulate a “point source” antenna. I purchased a small switch-mode USB power supply to power the system. 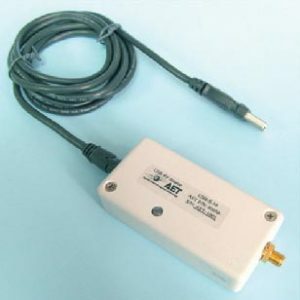 The generator is connected to the antenna with a short coaxial cable. During the chamber test, it’s best to use several ferrite chokes spaced evenly along the coax and power supply cable to reduce any effect of cable radiation by common-mode currents. Figure 13 – 3D plot of frequency, amplitude and azimuth (rotation) from zero to 360 degrees. This plot shows the amplitude versus frequency of the system. The amplitude falls off at the low end due to inefficiencies in the antenna. You can also see that the omnidirectional antenna used becomes less so above about 700 MHz. While the comb generator above is pretty versatile in general, it’s not really designed to easily produce an omnidirectional signal for chamber measurements. For this, I’d recommend one of the many battery-powered comb generators designed for this purpose. The AET Model DRFS (Figure 14) is one of many examples. This generator may be adjusted with a recessed rotary switch, to 10, 64, 100 and 133 MHz comb frequencies. Harmonic frequencies are useful well into the GHz region. Figure 14 – AET model DRFS comb generator. This was designed to use as a calibration source for anechoic chambers and is useful out to 5 GHz. While this model was designed to be attached to horn antennas, attaching a short vertical monopole makes it useful for verifying chamber measurements (in vertical polarization, only). Any short antenna (including DIY from stiff wire) should work satisfactorily. Ideally, it should resonate mid-band in the operational range of the generator. Figure 15 – The USDS spherical harmonic comb generator from Applied Electromagnetic Technology. One of the best solutions for use in semi-anechoic chambers would be the spherical dipole comb generator, such as AET’s USDS model (Figure 15). This may be oriented in either a horizontal or vertical polarization. Being self-contained, there are no cables to disrupt the field. Many other companies make comb generators, including Com-Power (www.com-power.com) and York EMC Services (http://www.yorkemc.co.uk). Both companies sell a variety of models that produce useful harmonics up to 40 GHz. Com-Power (Figure 16) also makes one specifically designed to verify conducted emission test setups that covers the 150 kHz to 30 MHz range. Figure 16 – Radiated and conducted comb generators from Com-Power (Photo courtesy of Com-Power). Comb generators are certainly useful for characterizing chambers by measuring them as you would any normal product, but they are also useful for many other things. They may be used to determine the resonance of cables and as a pulse or harmonic generator for many of the experiments I demonstrate during my EMC seminars. My colleague, Doug Smith, has recently developed a couple unique uses for small comb generators – measuring the resonant frequency of cables and the shielding effectiveness of cable shields. These papers are listed in References 5 and 6. To measure cable or structural resonances, connect one probe to the comb generator and clamp it around the cable to be measured. This will inject harmonic currents into the cable. 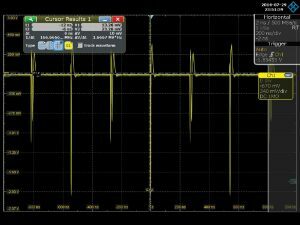 Connect the second current probe to the input of a spectrum analyzer. 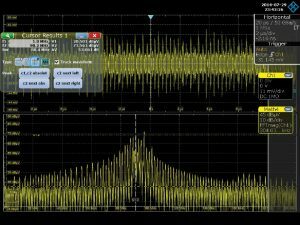 In my case, I used a Rohde & Schwarz RTE 1104 oscilloscope and used the FFT function to display a nice resonance spectrum (Figure 17). 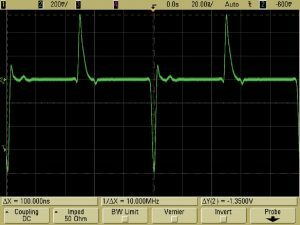 Figure 17 – Measuring the resonance of a 1m long cable using a couple of current probes and the AET 1.8 MHz comb generator. Figure 18 shows a typical screen capture of the cable resonance. I found the 1.8 MHz comb generator best to use for this purpose, because the harmonics are much closer together, allowing better resolution of the resonant peak. Interestingly, if you plug one end of the cable into the oscilloscope, so that the shield is connected to the instrument enclosure, the image of the 1m cable will reflect into the enclosure (plus line cord), effectively forming an electrical half-wave dipole at half the resonant frequency. I discussed this effect in Reference 11. Figure 18 – Received harmonic voltage from the current probe (upper trace) and the FFT of that voltage, showing the resonant peak at 88.4 MHz for the 1m long cable under test. Use of a comb generator is very handy during times when you need a known characterized and stable source of signals. They may be used to characterize anechoic chambers, perform as a pulse generator or measure cable or metal structure resonance. The DIY versions are easy to make and are a useful tool to add to your test lab. Kenneth Wyatt, Sr. EMC Engineer, Wyatt Technical Services, LLC, holds degrees in biology and electronic engineering and has worked as a product development engineer for 10 years for various aerospace firms on projects ranging from DC-DC power converters to RF and microwave systems for shipboard and space platforms. 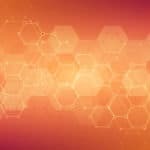 For over 20 years, he worked as a senior EMC engineer for Hewlett-Packard and Agilent Technologies in Colorado Springs where he provided comprehensive EMC design and troubleshooting services. During that time, he developed and provided advanced EMC training and corporate leadership for EMC. A prolific author and presenter, he has written or presented topics including RF amplifier design, RF network analysis software, EMC design and troubleshooting of products and use of harmonic comb generators for predicting shielding effectiveness. 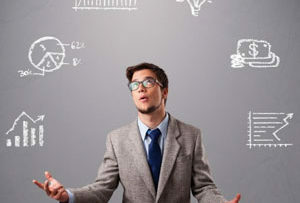 His specialty is EMI troubleshooting and is a co-author of the popular “EMC Pocket Guide”. He recently coauthored the book with Patrick André, “EMI Troubleshooting Cookbook for Product Designers”, with forward by Henry Ott. He has been published in magazines such as, RF Design, Test & Measurement World, EMC Design & Test, Electronic Design, EDN, InCompliance, Interference Technology, Microwave Journal, HP Journal and several others. He currently authors The EMC Blog for EDN.com and manages the “EMC Troubleshooter’s” group on LinkedIn. Kenneth is a senior member of the IEEE and a long time member of the EMC Society where he served as their official photographer for 10 years. He has also served as a U.S. delegate to the International Electrotechnical Commission (IEC) for the international EMC standard, IEC 61326 (ISM products). He received a bachelor’s degree in electronic engineering at California State University – Long Beach and completed additional coursework in physics at the University of California – Irvine. 1. Applied Electromagnetic Technology, a maker of commercial comb generators, www.appliedemtech.com. 4. Dave Eckhardt, Homebrew Comb Generator, private correspondence (January 2009). 5. Doug Smith, Using a Comb Generator to Demonstrate Impairment of Shielding Effectiveness of a Coaxial Cable, http://emcesd.com/tt2009/tt100409.htm. 6. 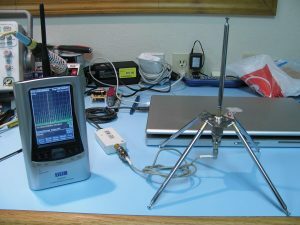 Doug Smith, Using a Comb Generator with a Pair of Current Probes to Measure Cable Resonance, http://emcesd.com/tt2009/tt110709.htm. 7. Kenneth Wyatt, AET Comb Generator and AET DRFS Review, http://www.emc-seminars.com/Technical_Articles/Technical_Articles.html. 8. Kenneth Wyatt, EMC Design of the HP 54600 Series Oscilloscopes, HP Journal, February 1992, http://www.hpl.hp.com/hpjournal/pdfs/IssuePDFs/1992-02.pdf. 9. Kenneth Wyatt and Dean Chaney, RFI Measurements Using a Harmonic Comb Generator, RF Design Magazine, January 1991. 10. Alan Yates, Yet Another Comb Generator, http://www.vk2zay.net/article/41, this one was also designed to produce harmonics in the 2.4 GHz band, but can be modified for many other frequencies. 11. Kenneth Wyatt, Measuring resonance in cables, http://www.edn.com/electronics-blogs/the-emc-blog/4423597/Measuring-resonance-in-cables, October 2013. 12. Evans Engineering sells a low cost omnidirectional antenna for $29.95, the model EE-3. Contact him at beach_bob@msn.com.